My little lady demanded some more changes to the curve and creature base. Things are getting scary if I'm honest. 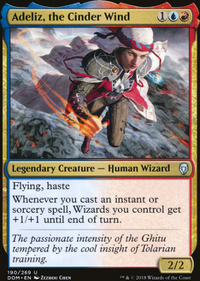 New to her build are three copies of Serum Visions and Gitaxian Probe and one additional copy of Cyclonic Rift. She seems to really appreciate torturing me with those copies of Spreading Seas however she felt four copies was a bit much so we tuned it down a bit to 3. Her sideboard is a bit more chaotic and incomplete so for now I will leave it unposted. I will mention that she decided to move Kraken's Eye to her main build. She's looking at running four copies of Lord of Atlantis with heavy breath and maybe a little bit of drool... :-/ but for now she'll just have to wait. The next real plan for now is to figure out a mana base that can help propel her game. Anybody out there with ideas for such a build would be greatly appreciated. 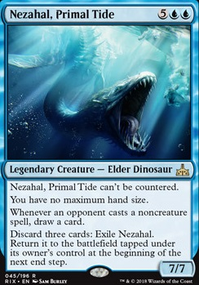 Beyond this monstrosity I really have no experience building Merfolk. I would probably swap Chart a Course for Think Twice. 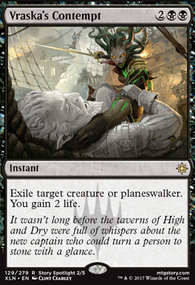 The reasoning is simply, you don't have a lot of creatures to attack with and Think Twice being at instant speed means you can hold mana open for counters and then cast it EOT if you don't need to counter anything. Beyond that it holds value even if you have to discard it. 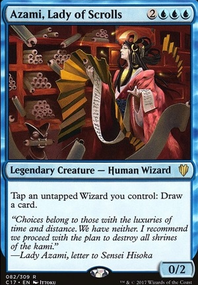 Dictate of Kruphix has it's uses but I feel like you would benefit more from Opt or Serum Visions as a form of additional draw. You really don't want to be feeding the opponent answers. I would also suggest you drop Sphinx of Magosi, Cancel, and Oppressive Will from your SB completely as well as cutting Guile down to 1 copy. I can't think of a single match Sphinx of Magosi would be relevant in. Even then Staff of Nin is probably better for the mana. Cancel is overpriced. You really don't want to be boarding in additional 3 mana counters. They're just too slow for the format. Disallow works because you can stop fetches and other relevant activated abilities but Cancel doesn't offer much utility. Oppressive Will again is overpriced and conditional. I would instead add 1x Lone Revenant in place of the additional Guile. 4x Spreading Seas in place of Cancel. 3x Ceremonious Rejection in place of Sphinx of Magosi. 1x Telepathy & 1x Kraken's Eye, Disdainful Stroke, Summary Dismissal, or Reality Shift in place of the 2x Oppressive Will. Eye of the Storm? Kraken's Eye? Ophidian Eye? This deck has come a long ways. I would cut the Authority of the Consuls for 2 more Delver of Secrets Flip. I think Kor Firewalker or Dragon's Claw/Kraken's Eye is better in the burn match up than the Outlander. Spreading Seas also might be a more relevant sideboard card. I feel like the best things to take out at the moment are probably Kraken's Eye, or Malfunction. Looks pretty good in general though! Adds I would recommend: More lands 35 is pretty risky and generally you would prefer mana flood to mana screw. I would aim for 38 myself. Utility lands Yeah, this list runs Back to Basics but you will not always draw it and a couple dead lands with it out still is not so bad. 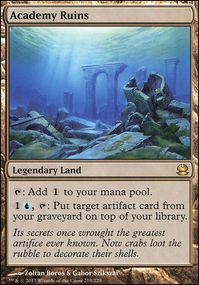 You exclude a lot of useful effects like Reliquary Tower, Myriad Landscape, Riptide Laboratory (for protecting talrand), Faerie Conclave/Dread Statuary (for emergency blocks) etc. 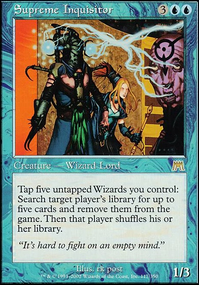 by not running nonbasics and mono-colour decks with no duals have the most space for those. More mana acceleration Most edh decks need ramp and this deck is no exception. With more mana, you can counter more spells per turn cycle. Sol Ring and other mana rocks are staples. I would aim for ten total. More card draw Same deal as ramp. Most of your counters trade 1 for 1 with your opponent's spells so you will need hand refills or you will run out of cards trying to trade 1 for 1 with 1 with 3 or 4 opponents. Pretty basic multiplayer card advantage. This deck prefers instants so it can keep mana up for counters. Blue Sun's Zenith, Stroke of Genius, and Pull from Tomorrow have a big impact. Perilous Research costs little and you can just sacrifice the drake it makes. Board wipes Some games you will fall behind your opponents so you need more reset buttons. Evacuation, Inundate, Crush of Tentacles, and Engulf the Shore all get you out of sticky situations and simulate a blue Wrath of God. Oblivion Stone permanently destroys. Other Curse of the Swine, Pongify, and Rapid Hybridization are all instant or sorcery spot removal. Rise from the Tides gets you a LOT of tokens. Dismiss replaces itself. Propaganda protects you. 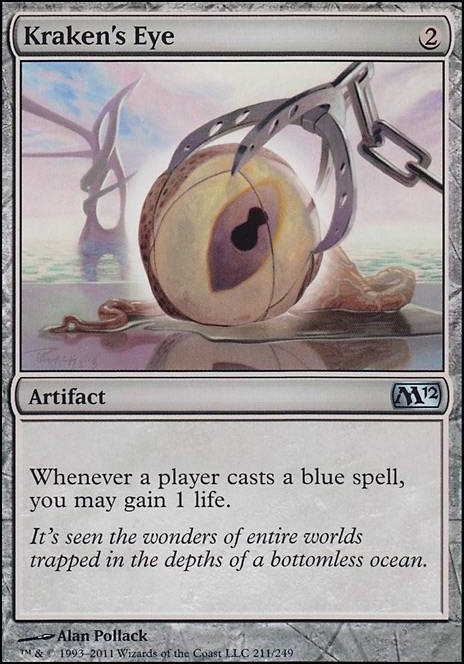 Brainstorm, Telling Time, Think Twice, Opt and other cantrips do not really give you net card draw since you use up a spell to cast them, but give you card quality instead.Cuts I would recommend: Kraken's Eye is probably bad because cards that only gain you life typically are. Elixir of Immortality is the same unless you are regularly near decking yourself. Backfire, Creature Bond, Feedback, Power Taint, Psychic Venom and other cards that only damage players are typically too low impact in edh. Disperse and Flash Counter are strictly worse than Into the Roil and Dispel. Cancel is strictly worse than s many other options; here is an entire article detailing them: http://articles.edhrec.com/in-the-margins-cancel/ Disappearing Act seems worse than Cancel unless you particularly want to replay your permanents. Just so you know Bottomless Vault isnt modern legal. You could use Saltcrusted Steppe, Molten Slagheap, Dreadship Reef, Calciform Pools, Fungal Reaches or Mage-Ring Network for a similar effect.